Canadian students earned the right to create Gay-Straight Alliances in their schools earlier this year, but that doesn’t mean Catholic administrators are making the process easy for them. Leanne Iskander, 16, who founded the school’s “unofficial” gay-straight alliance in March, tells Xtra the Dufferin-Peel Catholic School Board put the kibosh on displaying any rainbows at their information booth. 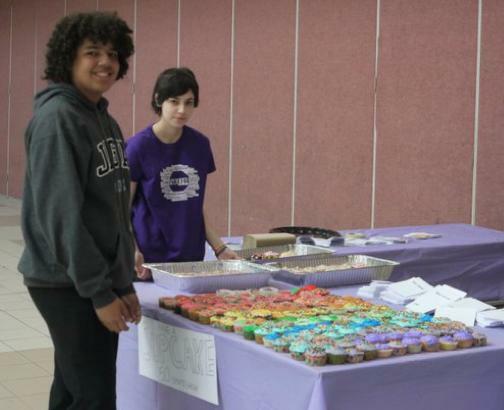 Iskander and her fellow students organized a student run bake sale to raise money for LGBT Youth Line, but were forbidden by Dufferin-Peel Catholic School’s Board from donating their $200 to the non-profit group. Instead, the school board forced the GSA to give their hard-earned money to Covenant House, a Catholic homeless shelter. Bruce Campbell, spokesperson for the board, could not be reached for comment. Casey Oraa, chair of political action committee for Queer Ontario (QO), has been supporting the students since they first submitted the GSA proposal. He says the rejection of the rainbow flag and the board’s insistence of using a Catholic charity over one chosen by the students proves administrators have no interest in diversity. Oraa says it’s absurd to ban the rainbow flag, but it’s completely in keeping with the Catholic board’s treatment of queer students. Ugh! We applaud the students at Dufferin-Peel Catholic School for standing up for themselves and their LGBT classmates. Shame on the school board for doing everything in their power to fight these brave kids every step of the way!